Nose Mask Pit Fights Allergens Discretely | OhGizmo! I am fortunate enough not to have any allergies, but one of my close friends is very allergic to smoke. If we go anywhere that’s very smoky, she can’t stay for long before her allergies kick in. There’s not much that she can do, aside from wearing a face mask, which no one wants to do. Luckily these little guys should also do the trick. 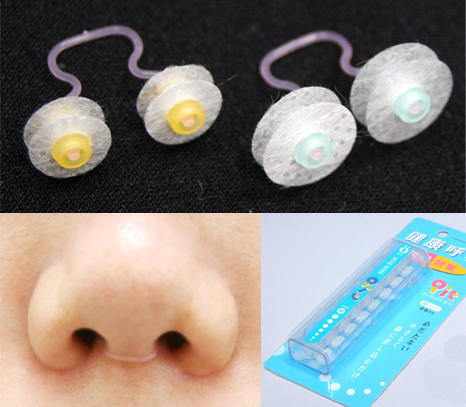 They are basically small air filters that stick up inside your nose. While they probably wouldn’t be the most comfortable things in the world, they are very discrete. Only a small clear band is visible at the base of your nostrils. You can pick up a pack of them for around $14. Cute idea but they won’t work. You breathe in through your mouth whether you want to or not when you speak. So you either side in the noxious environment saying nothing or you absorbent allergens through your mouth. Do they have HEPA grade filters?